I don’t often comment on specific world leaders or isolated political events, choosing instead to look at the big picture as much as possible and what it may mean to the reader’s future. However, I’ve repeatedly been asked to comment on the liberal press (worldwide, but particularly in the US) reporting false news regarding Donald Trump. This, of course, is an ongoing trend, but the reports appear to be increasing in frequency, severity of criticism and, indeed, pettiness. The image shown above is a good example. 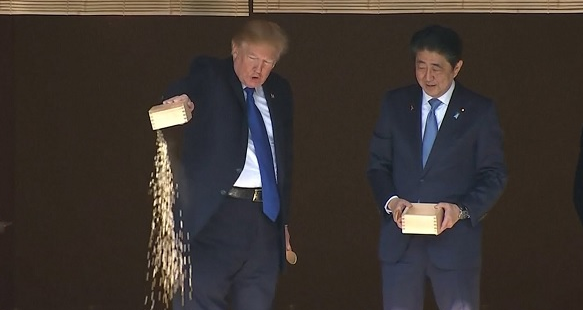 Mister Trump is seen dumping fish food to some koi in Japan. The liberal press berated him for this “crude and murderous act.” They stated that Prime Minister Shinzō Abe looked on in horror as he did this, since, as most people know, it’s easy to overfeed pet fish and kill them. In actual fact, it was Mister Abe who first dumped his box of food to the fish. Mister Trump simply followed his lead… but that part of the video had been removed by the liberal media, in order to unfairly discredit Mister Trump. Of course, this report in the liberal media is extremely easy to debunk, merely by showing the entire sequence of events. As these reports on liberal television news networks are becoming increasingly frequent and yet increasingly transparent, non-liberals are increasingly stating that the liberal media is becoming so discredited as a result of “fake news” that it may soon self-destruct, as their viewers will surely abandon them in favour of honest reporting. Nothing could be more incorrect. The critics of the liberal media, of course, are looking at the situation from their own point of view, rather than from the point of view of liberals. If they were to do the latter, it would become apparent that the trend by the liberal media is, in fact, highly successful and sustainable. At present, the US may well be in a state of the greatest political polarization in its history. This has been created by both the liberal and conservative media. The American people have been living under an economic cloud since 2008 and, from a visceral standpoint, they want someone (not themselves) to be blamed for it. The media have happily played into this need. Half of the American public detest President Trump, and are only too happy to be fed further fuel for their hatred. For the most part, they choose to view only the television networks that support their view and, therefore, will only rarely learn that a story has been falsified. In addition, on the occasions that they do learn that their favoured networks have falsified events, they will not care. They may well regard this as mere rumour, or, worse, false denials from the conservative media. As a result, they’ll be more determined than ever to detest the Trump Monster. When people are angry, they must have a demon to blame. Even on those occasions in which the average citizen is directly confronted with solid reason for doubting his favoured media programmes, this is tantamount to challenging his religion. The exposé will either be derided or entirely discounted by him. To be fair, it’s not the liberal media alone that tends to practice this method. The conservative media do the same, albeit generally, to a lesser degree. But the takeaway here should be that the liberal media are not on the verge of self-destruction. They are, in fact, satisfying their audience as never before. Well, if we can rely on historically similar situations, what we’re likely to see is a country that becomes ever more divided, with left hating right and right hating left to an ever greater degree, as economic and social conditions worsen. There can be little doubt that Mister Trump will leave office in disgrace in the view of at least half the American population. Whether he leaves forcefully or voluntarily, we cannot yet foresee, but we can be certain that the cry for him to be removed will become increasingly louder and, in the eyes of liberal media viewers, ever more justified. In the wake of his exit, I believe that it will be easier than ever before in US history to usher in a new collectivist candidate who can be presented as the American saviour—someone who will promise “a chicken in every pot,” to be paid for by the “greedy” one percent, of which the Trump Monster is considered to be a textbook example. When I was a boy, the cinemas ran “monster movies” every Saturday. In each such movie, the monster was always destroyed in the end. This particular movie will end the same way. “Fake” news, however, will not end. Quite the opposite. It will thrive. The nebulous economic cloud Americans have been living under since 2008 is quite real. At this point, a full-blown collapse of the US economy has become inevitable. When it happens, though, it will also create unique wealth-building opportunities for investors who know where to look. Find out more in our Guide to Surviving and Thriving During an Economic Collapse. Click here to download your free PDF copy now.